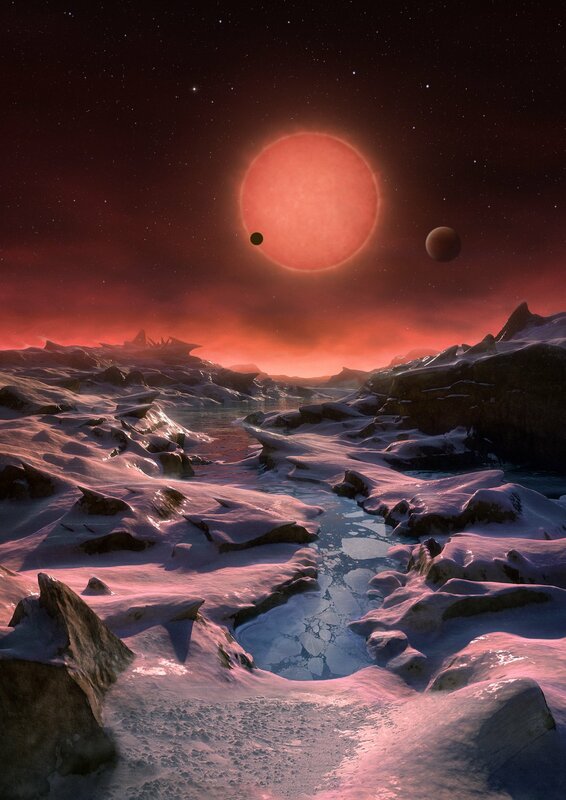 This artist’s impression shows an imagined view from the surface one of the three planets orbiting an ultracool dwarf star just 40 light-years from Earth that were discovered using the TRAPPIST telescope at ESO’s La Silla Observatory. These worlds have sizes and temperatures similar to those of Venus and Earth and are the best targets found so far for the search for life outside the Solar System. They are the first planets ever discovered around such a tiny and dim star. In this view one of the inner planets is seen in transit across the disc of its tiny and dim parent star. Seven planets have been discovered orbiting a ‘dwarf’ star named ‘Trappist-1’ which is about 40 light years [235 trillion miles] from Earth. The findings appeared this week in the journal Nature. Telescopes on the ground, in space and scheduled to launch next year, should be able to study the atmosphere and determine if any planet can support life. Trappist-1 is eight percent of the size of our sun and, at a temperature of 4,150 degrees Fahrenheit, 10,000 degrees cooler. All seven planets are close to the star, which means they orbit quickly – between 1.5 days to 12.35 days. Scientists think the surfaces of the fourth, fifth and six planets might be at the right temperature to have water, one of the essential conditions for life. So far, scientists have determined that the two closest planets are rocky [terrestrial] like Earth, and, like our moon, one side of the planet likely most always faces their sun. Scientist speculate this side would be warmer, but, the dark side could support life too because atmosphere could retain hear. Because of the cool, less radiant sun, the side of the planet facing it would be much dimmer than earth. From the middle planet, the sun would seem three times larger than ours, like a dim, large, red sun toward the end of twilight. If observations reveal oxygen, with methane, ozone and carbon dioxide in certain proportions, life is almost certain to exist, scientists think. Has Trump declared this ‘fake news’ yet?